1. Hot boys galore. While the twentysomething in me saw how exhausting it must be to raise twelve boys my inner 17-year-old was eating it up. What teenage girl would turn down living with a house full of hot boys? Apparently Jackie Howard! I loved that the author allowed Jackie to have a clear and level head in the midst of the Walter boy craziness. While the boys try to vie for her affection, she remains true to herself with the slight occasional swooning here and there. 2. Family, love, and home. When Jackie finds her world uprooted and turned upside down, she feels like a fish out of water in her new Walter-esque surroundings. Despite this, Jackie soon realizes that home is not a place, but the people that she chooses to surround herself with. While the Walters are a crazy and mixed-up family, they provide her the love and support that she needs to face big decisions throughout the novel. 4. Get ready for a heavy dose of cheese. I won’t lie. This book is loaded with cheesy moments. Despite this, I loved the cheese, down to the last heart flutter and bated breath. Novak gives us a chick lit story that is heartfelt and wildly romantic, making it desirable to any teen reader. While I am twenty-five with a grown up job, parts of me miss being 17, and Novak reminded me of that. To me, that is a sign of a good book. If you are looking for a silly and romantic book that is crawling with cute boys, then this is your book. 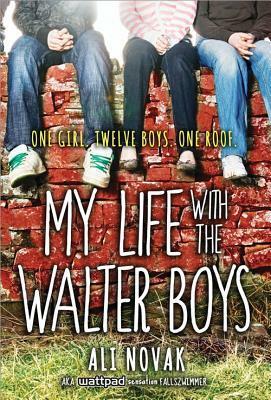 My Life With the Walter Boys is a quick read that provides you laughter and the occasional swoon from beginning to end.